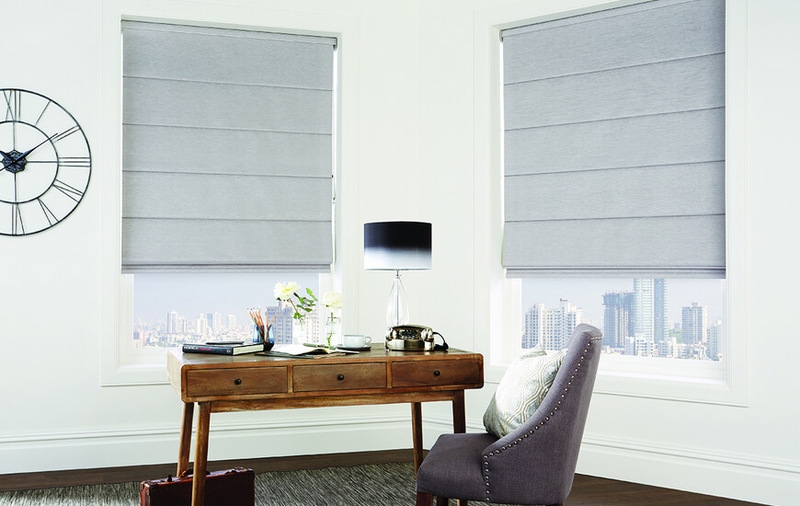 Our inspiring electric Roman blind range offers elegance in every detail and easy one touch control. We offer a collection of high quality materials in natural textures and tones, and stunning patterns designed to bring warmth and life to any room in the home. Our bespoke Roman blinds are made to an extremely high standard, and can be upgraded to block out the light. Classic Roman blinds are renowned for the way they elegantly fold upon every raise. Our motorised roman blinds can be raised and lowered with ease, at the touch of a switch, remote button or even an App, and rest with pinpoint accuracy to add a real sense of sophistication to your interiors. No matter what size your windows, they are a focal point in almost any room. It makes perfect sense to have a window treatment that is both functional and decorative. Our Roman blinds are the ultimate window furnishing and can be made to fit most window sizes. We don’t stop at looks when it comes to blinds. We also offer the ultimate in control with the latest Radio Technology Somfy® (RTS) control system. Operating your electric blinds couldn’t be easier. Choose how you want to control your blinds, either at the flick of a switch, the touch of a remote button, or from your smartphone or iPad. With the RTS system, you simply plug in the RTS receiver and you get full control of your blinds. Privacy, light and temperature preferences can be controlled in an instant or via a timer allowing you to open or close blinds at any time of day or night. The motorised operation ensures every inch of fabric is folded evenly. If you are looking for the ultimate finishing touch to your home décor, our electric Roman blinds are sure to hit the mark. Our classically attractive Roman blinds are neatly raised, lowered and folded when your blind is operated. Do you want to make your home look amazing? Get in touch today to find out more about our beautiful Roman blinds. Call us now on 0800 953 0199, email us at info@aqblinds.co.uk, or come and see us at our showroom for inspiration and chat to one of our expert team. We’ve been making and installing blinds for over 30 years. We only produce high quality luxury blinds because we believe in investing in the highest quality manufacturing equipment to keep us ahead of our competitors. If you are looking for a superior blind solution, Aquarius Blinds can bring you the kind of window treatments that wow. Why not add some sophistication to your interiors with our electric Roman blinds.